‘Where can I eat typical American food in New York?’ It’s a frequently asked question. First things first, what is ‘typical American food’? Of course, I’ll start with my good old favourites: burgers and pizza. Another very American thing to do is eating ‘Southern soul food’, such as barbecue dishes and pulled pork. Besides that, there is the new American cuisine, since the food culture is rapidly evolving in the United States as well! In this top five, I tried to make a selection of various restaurants, all representing the American food culture in their own special way. Going for dinner at Virgil’s Southern-style barbecue restaurant? Order ‘train wreck fries’ as a starter for all. This doesn’t sound too appetising, but it is. It’s actually a pile of fries, bacon, cheese and other good stuff. 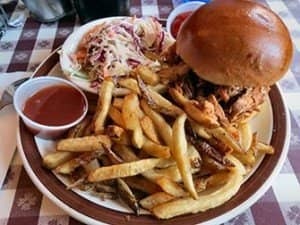 I then recommend to choose the pulled pork, which is truly delicious. Other typical specialties on the menu include mac and cheese and hushpuppies for example. They even make their own sauces. You’ll always have about four of them on your table. The interior is spacious and tidy. It’s a great place to visit with (small) children. At The Mercer Kitchen they serve new American cuisine. You can go there for burgers, but also for a tuna pizza with wasabi for example. It’s a bit upscale, with a romantic atmosphere due to its underground location. The perfect place for a date! The owner is the well-known New York chef Jean-Georges Vongerichten. Just taste his creations once, and you’ll immediately understand why he rose to fame. There is a varied menu, with lots of healthy ingredients and an emphasis on fish- and seafood. A bit like Virgil’s, only the quality of the food is a little less, and the atmosphere much better. 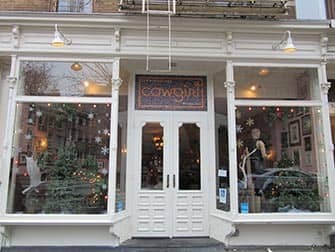 You’ll find Cowgirl in a quaint street of an attractive neighbourhood: Greenwich Village. They’ve selected the decorations with the utmost care: it’s like you just walked into a Spaghetti Western, only they don’t serve spaghetti. They do serve other pasta dishes with a ‘Western twist’, mozzarella sticks with bacon and fresh jalapenos and a cowboy steak accompanied by green chillies and sundried tomatoes, to name a few. Make sure to reserve some of your appetite for ‘New York’s best dessert’: baked potato ice-cream. It’s like a baked potato, only the taste is quite different. Let them surprise you! You can visit this place for lunch and dinner. It’s all very low key, you can just as easy wear a cap, not a problem at all. Just doing this, is already a very ‘typical American’ thing to do of course. A warning first: Gotham is quite pricey. You’ll easily pay $35 for a main course – something extremely expensive from an American point of view. That’s why this is the perfect place for a night full of luxury. You’ll get delicious food, prepared by famous chef Alfred Portale. In his restaurant, he serves new American cuisine: surprising combinations of traditional ingredients, like his favourites pumpkin, kale (known as a superfood and currently rather hip) and fish. 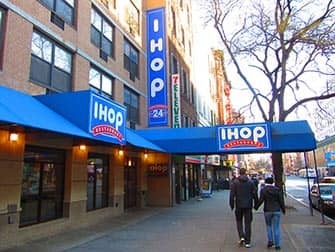 IHOP makes it into this top 5 with a wildcard. Why? This chain is the ‘love it or hate it’ kind. It’s not quite the definition of ‘atmospheric’ as you might know it, but it does show you the way hundreds of millions Americans spend their mornings. In this – mostly – breakfast restaurant you can choose from a wide variety of different pancakes and syrups. They also serve a fine brunch (after which they’ll have to roll you out of the restaurant) and ‘lumberjack breakfast’ – the Canadian version of our English breakfast. Oh, they do love strange combinations. I remember eating a steak filled omelette for breakfast, as if it was a kind of taco. Prices are really low. Again: don’t expect any atmosphere whatsoever, do expect an all American experience though – including ‘unlimited coffee’ and ‘unlimited pancakes’ once in a while. Be prepared!